King’s Lodge, also known as Abergele Lodge is Located at the west end of the Abergele, at the junction of a lane to Tan-y-Gopa and Betws-yn-Rhos. It was built as a gateway to Gwrych Castle. The boundary wall, with its various lodges and gates probably followed the main building's completion ca1822, although works continued until ca1850. The lodge is built of uncoursed limestone rubble, with squared dressings and slate roofs. Twin drum towers rise to a deep crenellated parapet in the manner of the Edwardian castles of North Wales. Between the towers, the outer gate has a 4-centred chamfered arch, and above, the family arms on a shield. 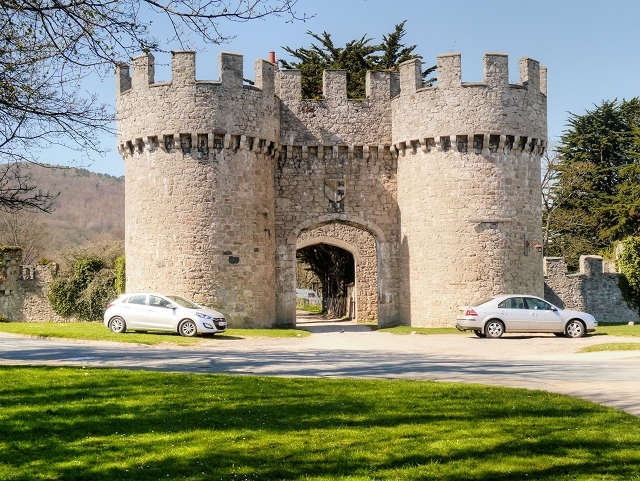 The lodge is grade II*-listed as “a conspicous landmark; an exemplar of the fashion for castellated structures of the time, and with important group value with the castle and other structures on the Gwrych Estate (Cadw Building ID: 233 Link British Listed Buildings).